A light and satisfying sourdough treat for all to enjoy! If you have a gluten-free sourdough starter, you can use it for this recipe. These mini cakes are unique because they are free of all top allergens. So no eggs, gluten or dairy! Note: If you are making these for a special meal make sure to plan as the first step of the recipe requires some extra time. To a large glass bowl, combine flours, hemp milk, lemon juice and starter. Mix well, cover and place bowl in a warm area for 5 hours. Line muffin tin with unbleached parchment cups (10 in total). Combine lemon zest, maple syrup, coconut oil, water, salt, and mix well. Sprinkle baking soda and baking powder overtop the fermented flour bowl (Step 1). Add in wet ingredients, fold in until combined, the batter should be very bubbly and airy. Add cake batter on top of the maple syrup. Fill the other two empty spots with a little water. Bake for 20 minutes, until edges are golden. Cool on rack and serve! * To prepare homemade hemp milk, combine 1/3 cup hemp hearts (seeds) with 1-1/4 cup water in a high-speed blender and blend until frothy and white. Pour the milk through a nut mesh bag, cheesecloth, or superfine strainer to remove larger unwanted bits. If using coconut milk from a can, make sure to combine the coconut water and cream to get some of both. Try not to use plant-based milk with a whole bunch of other unnecessary ingredients. 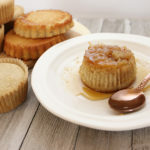 ** The mini cakes can be baked without the maple syrup. You can always add maple syrup to a bowl and serve the cake on top. For extra sweetness, you could do both! Regular sorghum and sweet sorghum flour should work well. Same for white rice or sweet white rice flour. When combined with other gluten-free flours the blend will yield similar results. If you want to experiment, millet flour is a great gf flour substitute. I haven’t tested the recipe with a 3-flour combo. Make sure that all flours are certified gluten-free if you have allergies or intolerances to gluten. I haven’t tested this recipe with a substitute for the gluten-free brown rice starter, but I have a feeling coconut yogurt could work. I will include the results here once tested.